Knowing when to share brand-related content on your Facebook page can be a messy guessing game for even the most experienced marketer. Each brand page’s audience is unique and Facebook’s continual tinkering of its news feed algorithm makes the job of staying relevant all the more challenging. Even with these obstacles, it is still useful to possess a general understanding of what days of the week see the highest level of engagement. Fortunately, LinchpinSEO has put together a handy infographic that highlights this information, segmenting the days that have brands have the most Facebook engagement. This information is based on data that was compiled earlier last year by Buddy Media, who analyzed over 1,800 brand Facebook pages over a two-month span to come up with their findings. Below are some general findings from the study. Interactions here are defined as a like, comment or share that a post receives. Posts published between 8 PM – 7 AM received 14% higher interaction than posts published between 8 AM – 7 PM. Brands that post once a day see 19% higher interaction rates. Pages that most more than 7 times per week see a 25% decrease in interaction rates. Interaction rate for weekend posts is 14.5% higher than weekday posts, yet only 14% of posts are published on weekends. How is this relevant for hoteliers and restaurateurs? Well, the data on hospitality-related industries further informs the fact that higher page interaction rates can be achieved by making sure your brand is publishing towards the end of the week and especially on the weekend. If you manage a restaurant’s Facebook page or have a food and beverage operation on-property, it would be wise to incorporate this kind of content when planning your posting schedule in advance. The data related to travel and leisure fan pages confirms higher levels of fan interaction on days leading up to and including the weekend. Interaction levels begin to increase on Thursdays and peak on Sundays, when page liking, commenting and sharing is 19% higher than average levels. 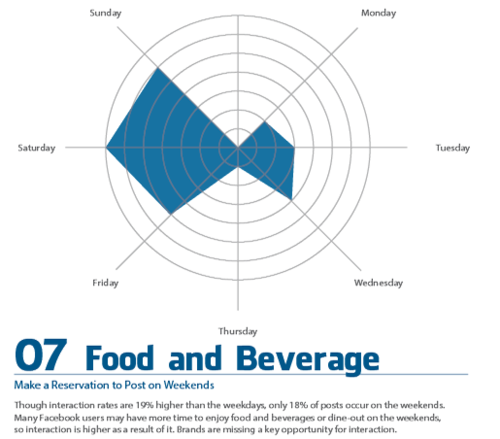 Even if your hotel or restaurant does not have the resources to man your social media operation 24/7 by posting on the weekend in real-time, take advantage of Facebook’s scheduling option – which is accessible in your Revinate dashboard – and queue up your posts before leaving the office for the weekend. An engagement opportunity like this is too good to pass up on. Let us know how this posting tactic works for you! Not surprised as the week goes on that people are thinking more about leisure activities, restaurants and getaways but I find it interesting that posts published between 8pm and 7am receive higher interaction than those posted during the “workday”. This makes the tools that let marketers schedule posts even more valuable and hopefully it means people are getting work done during the day!